HomeDon JenkinsFour MOH recipients Grand Marshals Kentucky Derby Pegasus Parade today! Four MOH recipients Grand Marshals Kentucky Derby Pegasus Parade today! Four Medal of Honor recipients will serve as Grand Marshals of the 56th annual Kentucky Derby Festival Pegasus Parade today Thursday, May 5 at 5:00 pm. The Grand Marshals are: World War II veteran Hershel “Woody” Williams of West Virginia; Korean War veteran Ernie West of Russell, KY.; Vietnam War veteran Gary Littrell of Henderson, KY; and Vietnam War veteran Don Jenkins of Quality, KY. The members of Bellarmine University’s NCAA Division II men’s national champion basketball team will serve as Honorary Grand Marshals of the Pegasus Parade. 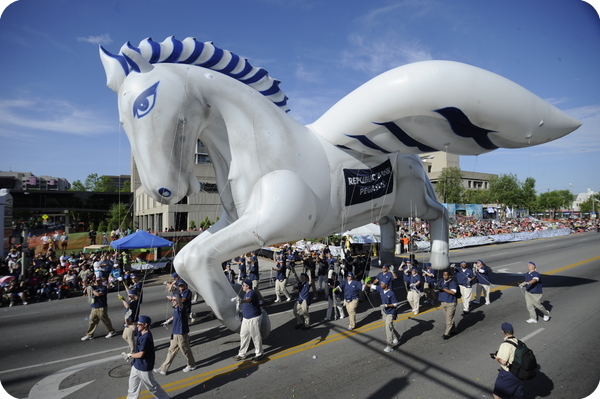 The theme for this year’s parade is “Heroic Adventures” and ties in to the overall theme for the 2011 Kentucky Derby Festival = “SuperFest” – which celebrates TV, movie and comic book Superheroes, as well as heroic individuals from our own community. The men’s appearance in the parade is a prequel to the annual 2011 Louisville Congressional Medal of Honor Society Convention from September 28th through October 2nd. During that time, Louisville will welcome all 85 living Medal of Honor Recipients. The event marks the 150th anniversary of the creation of the Medal of Honor in 1861 by President Abraham Lincoln.